ギタリスト 藤井眞吾の日々 … Days of Shingo Fujii, guitarist & composer. Shingo Fujii was born in 1954, Japan, began to study the guitar by himself at the age of ten, and then under the direction of Ichiro Okamoto. After graduating from Kyoto University he went to Spain to study under the late Joseluis Gonzalez, late Jose Tomas and David Russell. Shingo won 1st prize in the “Young Guitarist Competition (Osaka)” in 1978, and obtained the diploma of the Royal College of Music, London (A.R.C.M.) 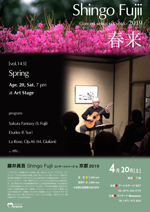 and won the “Luis-Coleman Prize” in the “Luis Coleman Competition (Santiago de Compostella)” in 1986.Shingo now gives numerous concerts throughout Japan, is invited to a number of music festivals.Guest professor of Shanghai Music Conservatory (2009/China).